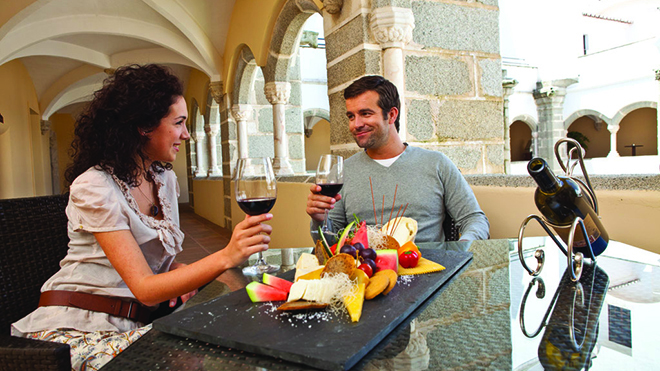 Portugal’s wine routes will provide some excellent trips to discover a pleasure that has been perfected over time. In fact, it is known that wine has been widely grown in Portugal since at least the time of the Roman Empire. Production has gone through many phases over time, but the year 1756 is worth noting, when the Marquis of Pombal created the Upper Douro General Vineyard Agricultural Company aimed at delimiting the 1st demarcated region in the world, registering the vineyards and classifying the wines according to their quality. Starting in the north, the Vinho Verde Wine Route runs from the Minho to the Douro. Green, which gives its name to the wine, is the predominant colour in the region, punctuated by historical cities like Braga and Guimarães, and others along the rivers, which are smaller but also full of charm. Examples include Amarante, Viana do Castelo, Barcelos and Ponte de Lima. This is a region of rural tourism, with palaces and manor houses whose vineyards are worth a visit to discover vines growing on trellises, the espigueiros (grain stores) and an amazing landscape that gives rise to light, young, fresh wines. The sub-region of Monção and Melgaço, alongside the river Minho, is within the Vinho Verde route, but is also the birthplace of the reputed Alvarinho, the most prized variety of vinho verde. For this reason, Alvarinho wine has its own route, centred around these towns. In the Solar do Alvarinho in Melgaço, or in the Paço do Alvarinho in Monção, you can try the wine, and taste or buy other regional products. The Port Wine Route follows hillsides of great scenic beauty with the River Douro meandering down below, between the mountains. It was this beautiful and unique landscape that won the title of World Heritage for the Alto Douro Vineyards. The route also includes the region of the Archaeological Park of Foz Côa, another World Heritage site. It encompasses cities full of heritage and tradition, like Vila Real and Lamego, but what distinguishes the DouroValley is its vast expanse of farms producing wine, many of them dedicated to wine tourism. You can stay overnight in their tourist accommodation, have wine tastings and participate in the work of the wine production, particularly during the grape harvest. These days, on this route, some excellent table wines, the Douro white, red and rosé wines, are produced by the same vineyards that produce Port Wine. Right in the centre of Portugal, the Bairrada Wine Route is located along the strip of coastline where Aveiro and Figueira da Foz beach are to be found, but also covers the area around Coimbra, a city classified as World Heritage by UNESCO. This region also contains some of the oldest and most reputed Portuguese spas, with thermal baths and health programmes. The suckling pig from Bairrada, one of the highlights of Portuguese cuisine, is particularly enjoyable accompanied by the great wines of the region, which include the sparkling wines, which Bairrada was one of the first regions in Portugal to produce. This is an area of great beauty south of the River Tagus, bordered by the Serra da Arrábida Natural Park and the Sado Estuary Nature Reserve, known for its friendly dolphins. The beautiful beaches of Sesimbra and Portinho da Arrábida, north of the Sado, are counterbalanced by the huge expanses of sand on the Tróia Peninsula, on the southern side. While Setúbal is the main city, with an historic centre that is well worth strolling around, Palmela and Vila Nogueira de Azeitão are the capitals of the Wine Route, with wineries and farms you can visit. The Setúbal Muscatel, one of the most reputed wines in Portugal, comes from this region. The Alentejo Wine Route stretches along the plains of the region, and is marked by the heat, except in the far north near the S. Mamede Mountain. Here is the walled Marvão, one of the most beautiful of Alentejo villages, and another further south, Monsaraz, on the edge of Alqueva. Borba, Redondo, Reguengos and Vidigueira are the names of lands and wines with a long tradition. The region's capital, Évora, owes its World Heritage classification to the variety and beauty of its heritage, but the entire region is worth visiting to enjoy a unique landscape, made of rolling fields, cork oaks and lakes which reflect the blue sky and the soul of a region where the power of the land wins you over.